Mucha was a principal contributor to Krokodil and various other periodicals published by Filip Kubr, who married his sister Anna in 1885. 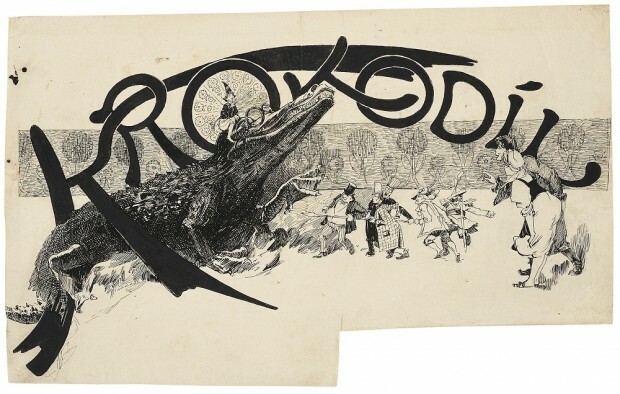 A letter sent to Mucha in Munich that year reveals the extent to which Mucha was bombarded with requests for illustrations from his brother-in-law: “Dear Friend, I am writing to you again and hope you don’t mind…The illustrations for the Krokodil and the Slon which you sent me are already in print.” As Mucha’s fame increased, so did such demands. Mucha’s designs for Kubr’s magazines from this period demonstrate his innovative approach to calligraphy and lettering. This developed fully with his poster designs in Paris.